Measure each room of your new home as well as the storage areas. This will help you visualize how much room you have to work with. Clear an area in your home or garage so you can sort things as you pack. 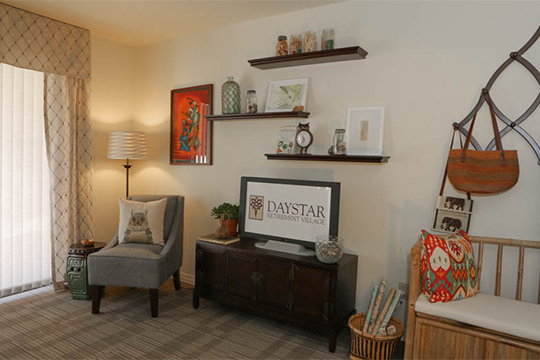 This will be your staging area so you can sort the belongings you no longer want, so set aside an area for each direction your items may go to. While everyone's situations are different you might have an area for your children and grandchildren, one for items to sell, an area to place items you wish to donate to a favorite charity, and an area for things you're taking with you on the move. Make a final area for things you're not sure about; you can go through these things and decide later whether to keep them or let them go. Ask your family and friends to come help you decide what goes with you and what to do with the remaining items. Get lots of packing boxes and refreshments in advance and plan on ordering pizza or a similar simple meal when you're done for the day. Make sure you have a few strong arms to move the heavier furniture you don't plan to keep. You don't have to do it all in one day; if you have a lot of belongings you can do it over a few days or weekends of work. Evaluate what you have left. Once you've sorted through your belongings you can take a step back and evaluate what you have left. Refer to the room measurements of your new home and determine whether the furniture you've chosen to keep will fit into the new spaces; if you still have too many belongings you can reduce the number of big items you're taking to your new home. Sell items you don't want. Sell the items you no longer want, either at a garage sale, consignment shop, or on a sales website. Remember to follow safety protocols if you're selling to strangers and have someone with you if the strangers come to your home. When you're finished sorting and packing go back to the area set aside for things you weren't sure about. Look through them again to see if you can eliminate any more possessions, and if you just can't bear to part with these things consider renting a storage unit or using an area in you adult child's home or garage to store them for six months. At the end of that time you'll be settled in your new home and have a clear idea of what you need or don't want anymore.